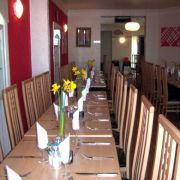 An intimate, 30 cover restaurant situated in the picturesque, coastal village of Rock in Cornwall. Food is prepared daily using locally sourced, seasonal ingredients from the surrounding areas. The restaurant is open for lunch and dinner throughout the year.